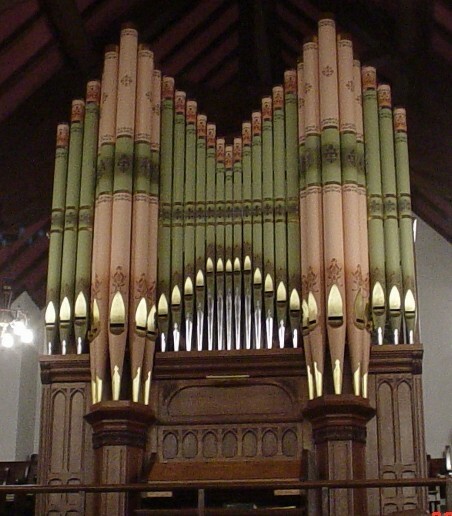 The Hinners Organ Company of Pekin, Illinois made this organ in 1903. The only modifications to the instrument are the façade and case which is also a Hinners’ product but from a different 1903 instrument. Only a small portion of the original case remained after the move of the instrument from its original church location next door south of this building. The instrument consists of nine ranks of pipes on two manuals and pedal, the only pipes not original to the instrument are the façade or painted pipes. The painting design and patterns of the façade is, however, a nearly exact duplication of the organ as built in 1903. The instrument is completely mechanical action with the only modification being the addition of an electric blower. The hand pumping mechanism has been rebuilt and continues to function. The sound qualities of the organ are exactly as it was 100 years ago, with no modifications. It had been realized that the instrument needed to be overhauled and after much consultation it was decided to move the location from adjacent to the chancel area to the balcony. This change has allowed it to have a much greater tonal presence because it is now free standing and not heavily enclosed as in the chancel location. Also, it is much easier to do adjustments to the mechanism and tuning is much easier in the new location. Prior to this the wooden chancel wall had to be removed every time any thing needed attention.